DETECTO Scale and CRS today announced the launch of a joint business relationship to bring DETECTO’s USA-made Enterprise® PoS scales and other retail scales to CRS’s network of distributors and dealers throughout North America. “DETECTO Scale is very pleased to have the CRS group marketing our Enterprise® scales to their PoS distributor network,” said Fred Cox, DETECTO Vice-President of Sales. DETECTO Scale and CRS today announced the launch of a joint business relationship to bring DETECTO’s USA-made Enterprise® PoS scales and other retail scales to CRS’s network of distributors and dealers throughout North America. As part of the joint agreement, DETECTO will be the primary scale manufacturer for CRS. DETECTO’s Enterprise® series offers 10 different digital scale models with four platform sizes and six capacities available. The Enterprise® scales feature optional NTEP legal-for-trade wireless capability for ease of data integration. They come with USB and RS232 serial ports standard. The easy-to-read, brilliant backlit green LCD display features bold 0.7-inch/18-mm high digits which are visible in nearly any lighting condition. Approval certifications include NTEP, Measurement Canada, and ETL. Both DETECTO Scale and CRS are active members of the Retail Systems Providers Association (RSPA) and privately-owned US corporations. DETECTO Scale was founded in 1900, and the company’s factory and corporate headquarters are located in Webb City, MO. 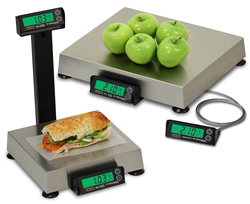 DETECTO manufactures a wide variety of scales and weighing systems for the retail PoS, foodservice, clinical, and industrial markets. Learn more at http://www.Detecto.com. 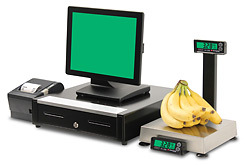 CRS, Inc. was founded in 1927 and is a wholesale distributor of POS systems, including electronic cash registers, point of sale terminals, printers, cash drawers, and scales. The company is located in St. Paul, Minnesota. Learn more at http://www.crs-usa.com.